On Saturday, a roofer stopped by my house to inspect damage from the May 29th hail storm. While he was on my roof checking for dents and dings, I stood in the driveway and we talked about hail size and storm damage. During the middle of our conversation, the roofer looked off to the east behind my house and quickly froze. He then turned around, chuckled and raced towards the ladder. Once he climbed down, he looked directly at me, wiped sweat off his brow and said “Your roof is totaled…and I just saw something I didn’t want to see.” That thing he “didn’t want to see” were my two gay neighbors shaving each other while standing in their backyard. Anyway, that same hail storm that totaled my roof, my neighbor’s roof and my roofer’s psyche also knocked Bob Moore Chopper 4 out of commission. As we reported last week, the news helicopter was pummeled with hail on May 29th because KFOR employees parked their cars in the chopper’s hanger, preventing it from taking cover when it returned to the station to refuel. 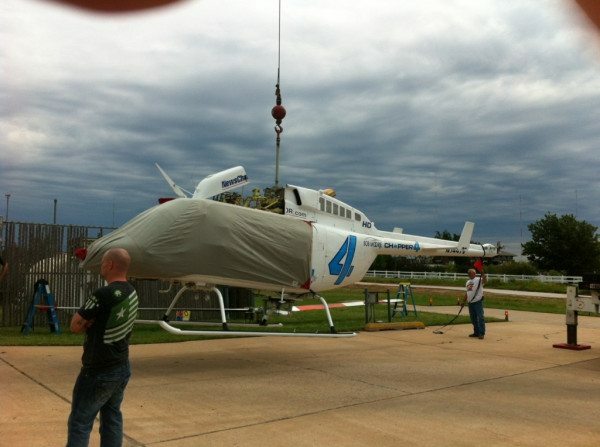 We were emailed a couple of pictures over the weekend of the Bob Moore Chopper 4 being sent away for repairs. Here they are. I don’t know about you, but this is just depressing. Bob Moore Chopper 4 should be bravely coasting through the Oklahoma air attacking hook echos and wall clouds. It shouldn’t look all vulnerable and weak like a broken dream or gay man shaving another gay man. That’s something nobody wants to see. Great video of Mike Morgan. We just saw his O face. Of course he said your roof is totalled. There is no money in it for him otherwise. Well, from those photos, there does appear to be quite a bit of damage. Rotor blades, both main and rear must be damaged beyond repair. Those blades are not that strong anyway. Plexiglass knocked out and could be all the way around. They have even removed the main rotor drive shaft. That would indicate it may have been dented or damaged in some way. All in all, this will be quite costly to KFOR or Bob Moore or whoever is footing the bill. I’m sure it was insured, but I wonder if the insurance policy has any riders that would exclude things such as this? If I owned it I would sure as hell make sure that the employees kept their cars out of the hanger. Who released those photos? No, don’t tell me; it doesn’t matter anyway. On behalf of KFOR and Jesus, the Ultimate Executive, I’m gonna hunt that moron down and fire random 25 people for starting rumors about “hail” and “broken helicopters.” You morons! You don’t even know how hail works! Gary – You don’t know what you’re talking about when it comes to rotors. They are INCREDIBLY strong (try to pick up a propeller for a Cessna 150 some time and you’ll understand). The rotors are removed in order to transport the helicopter on the flatbed. Skyking…you don’t know what you are talking about. Cessna propellers are made from steel or some metal alloy. helicopter rotors are made from carbon fiber. Heck, they have to have a coating on them to protect them from sand. Sand will eat up a helicopter rotor. Hail will ding them all up. one or two hail dents in a rotor will ruin it. Balance is more crucial in a helicopter rotor than anything. aluminum-alloy honeycomb core, and aluminium skin and nose block. They are hollow, with thin aluminum skin. Very susceptible to dints and dings. Each blade weighs about 94.4 pounds. Each main rotor blade is about 15 feet long. 37 foot overall rotor diameter. Baseball sized hail, as they were calling at KFOR, or even golf ball size, will dent the heck out of an aluminum skin honeycomb (hollow) core blade. I am going to go ahead and trust Gary one this one. Wow really? Too soon? YES! That is incredibly rude and heartless! Grow up. My friend’s father was killed in the plane crash and his birthday was yesterday so yes, too soon! It’s never funny to joke about tragedies. The only way for some people to deal with any kind of sadness is by joking about it. 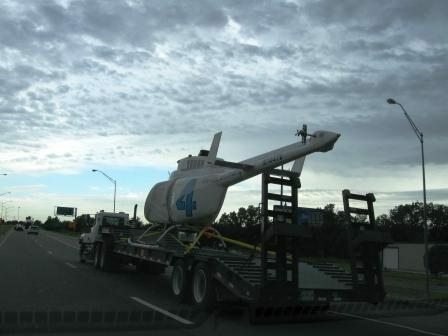 Confirmation, just saw it headed down Manvel Street in Chandler about 30 min ago…sans rotors…looked kinda, well, impotent…. Those KFOR employees wouldn’t have screwed with Jim Gardner that way…it’s his hangar bye-God …for his bird…the man is in the line of fire…needs to get back to base to refuel…get back on the front lines….lives are at stake. Wait a minute wasn’t KFOR’s boy wonder a highly touted veteran? WTF happened here? BobMooreChopper4 is not weaponized, had it been problem solved. Ogle Moles have to tell us who’s car!